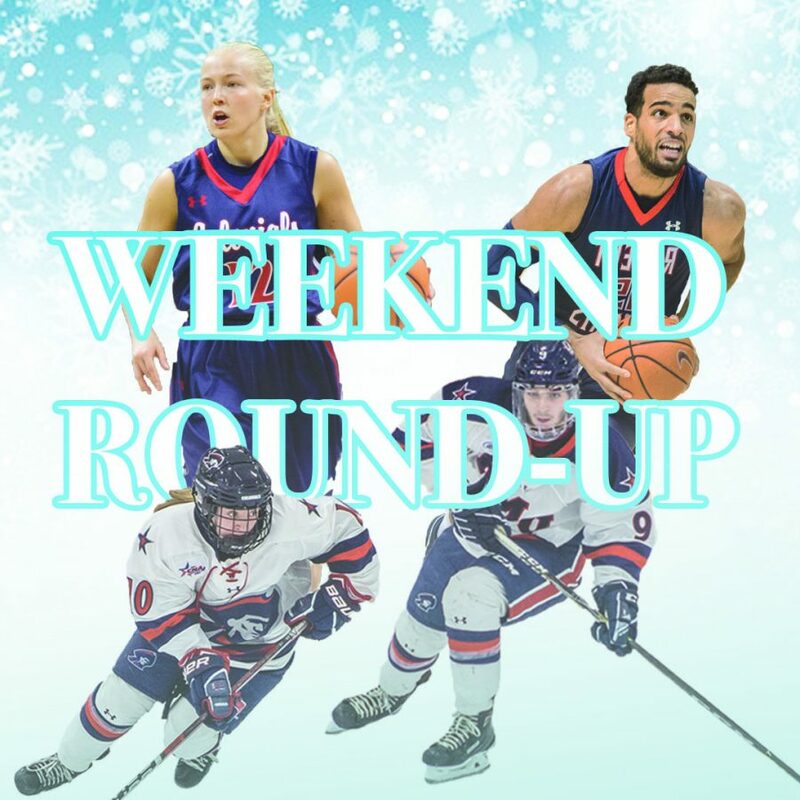 MOON TOWNSHIP — Not many RMU sports teams were traveling over the weekend, but here is a quick round-up to catch you up. At the YSU National Mid-Major Invitational, Robert Morris placed in many top spots over the course of the two-day event. Anna Chasovskaia placed in fourth place in the 500 meter run with a time of 78.68 seconds. Brooke Oldfin placed in sixth place with a time of 1:20.39. Lastly, Nina Radisavljevic placed in tenth with a time of 1:22.04. In the 1000 meter run, Tara Richardson placed in ninth place with a time of 3:08.02. In the pole vault, Kaitlyn Hawkins placed seventh with a height of 3.41 meters. In the long jump, Zoe Roush placed first with a distance of 5.51 meters, which is the seventh occurrence in RMU history and Roush’s first collegiate win. Tara Gologram finished in eighth with a distance of 5.19 meters. Lastly, Sam Buck finished third in the weight throw with a distance of 15.99 meters. Estelle Katende finished in tenth in the weight throw with a distance of 12.96 meters. In a thrilling performance the RMU men’s basketball team (12-10, 7-3 NEC) fell short against the Fairleigh Dickinson Knights (11-11, 6-4 NEC) by a score of 97-94 in double overtime. In the first half, Fairleigh Dickinson jumped out to an early 4-2 lead over the Colonials. After the Colonials got to a 37-35 deficit thanks to a layup in the paint by Matty McConnell, who recently became the 25th player in RMU men’s basketball program history to reach 1,000 points, the Knights went on a 10-point run to lead RMU 47-35 as they ran away with the score in the first half. The first half finished off with a free throw from Chris Coalman and a jumper from Yannis Mendy of Robert Morris that left RMU with a 47-38 deficit. Josh Williams had a great first half with 16 minutes played, three field goals, two three-pointers and eight points. In the second half, Robert Morris got off to a better start than the Knights did. After the Knights scored first in the half on a three-pointer to lead 50-38, RMU went on a nine-point run to come close to FDU and be down 50-47, which was capped off by a three-pointer from Williams. After both teams were knotted at 51 apiece, Robert Morris and Fairleigh Dickinson tied again at four different times throughout the rest of the second half to end the half in a 75-75 tie, leading to overtime. In the first overtime, FDU scored with a jumper and RMU scored with a layup to tie the game at 77-77 points each. After the game tied at 77-77 each, both teams kept each other at a one-point difference until the teams tied each other 84-84. Once that point was reached, FDU scored three consecutive times to lead 87-84, but that lead was short-lived once Dante Treacy scored a three-pointer for RMU to tie the game and end the first overtime half at 87-87, subsequently leading to a second overtime. In the second overtime, Fairleigh Dickinson jumped out to a 91-87 lead over RMU after four consecutive points. After both teams tied again at 93-93, Fairleigh Dickinson was able to hold off Robert Morris to secure a 97-94 win after two overtime halves. Williams finished out the night in amazing fashion with 44 minutes played, 12 field goals scored, seven three-pointers and 34 total points scored for the Colonials. Robert Morris returns to the North Athletic Complex on Thursday Feb. 7 at 7 p.m. to host the Bryant University Bulldogs (8-13, 5-5 NEC) in Northeast Conference play. RMU women’s basketball (12-8, 9-0 NEC) continued their recent hot streak with their ninth consecutive win overall and ninth consecutive win in Northeast Conference play with a 63-43 win over the Fairleigh Dickinson Knights (6-14, 3-6 NEC) on Saturday. The first quarter started off slowly for the Colonials, as RMU jumped out to an early 2-0 lead, but while FDU was slowly trying to catch up, Robert Morris began leapfrogging the Knights to a much bigger lead. After RMU got to a 8-5 lead over FDU, the Colonials’ Isabella Posset and Honoka Ikematsu each scored to increase RMU’s lead to 13-5. After FDU scored an additional two points from a layup to be down 13-7, the Colonials got on an eight-point run to lead 21-7. Robert Morris ended the quarter with a 23-9 lead over the Fairleigh Dickinson Knights. The second quarter started with a layup by Bryant to have RMU lead 23-11 at the start of the quarter. Once that happened, Nia Adams and Natalie Villaflor each scored to advance Robert Morris’ lead to 28-11. Fairleigh Dickinson slowly began to try and catch up near the end of the quarter, but Robert Morris was able to hold off FDU to end the quarter with a 35-19 lead over the Knights. The third quarter started with a free throw by Nia Adams to open the scoring of the quarter, this put RMU ahead 36-19. Once FDU scored to get to 36-23, RMU got on a 10-point run to lead 46-23 with about five minutes remaining in the quarter. FDU scored an additional six points to try and catch up, but Robert Morris held off the Knights to end the quarter with a 49-30 lead. The final quarter started with another free throw by Nia Adams to lead Fairleigh Dickinson 50-30. After that, the Knights scored three more points to be down 50-33. Once that occurred, Robert Morris kept pace with the Knights to win the game 63-43 on Saturday. Robert Morris returns to the North Athletic Complex to host the Bryant University Bulldogs (6-14, 4-5 NEC) on Saturday Feb. 9 at 7 p.m.